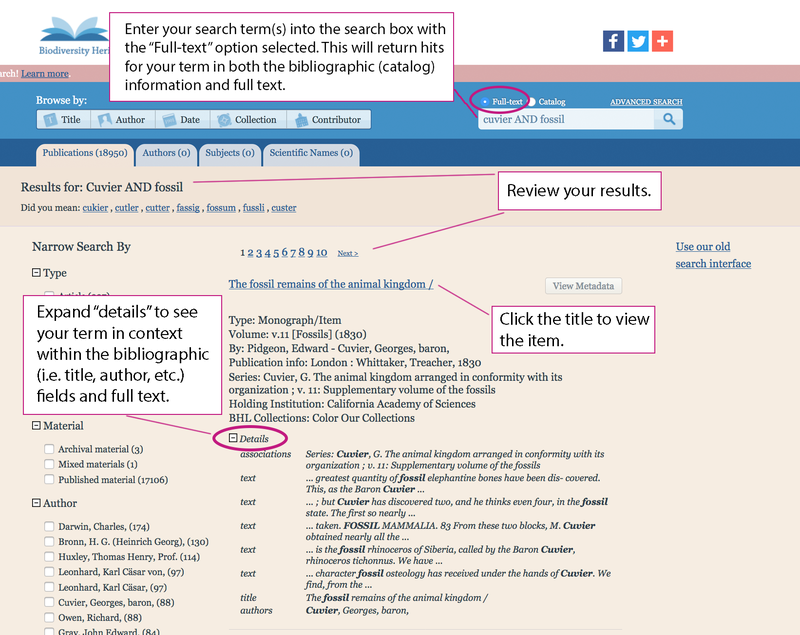 Announcing Full Text Search on BHL! New enhancement for BHL’s full text search implementation added August 2018: You can now choose to search the catalog only (i.e. 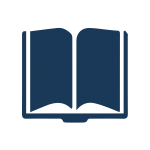 bibliographic metadata like title, author, etc.) or catalog + full text. Information below has been updated to reflect this enhancement. 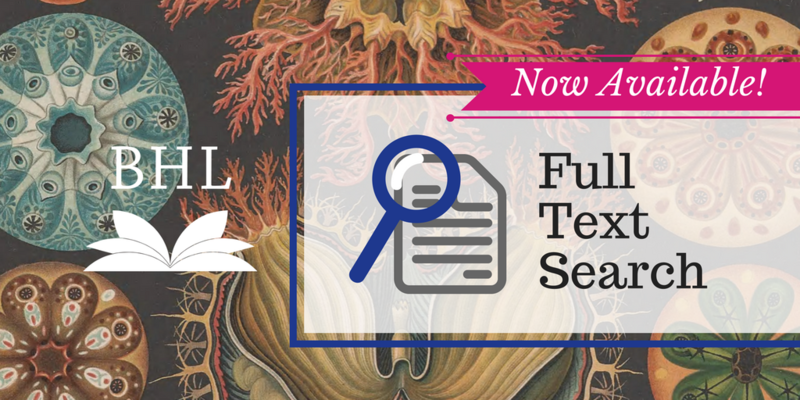 We’re thrilled to announce that full text search is now available on the Biodiversity Heritage Library! To start using this functionality, simply visit BHL, type a term into the search box with the “full text” button selected, and use our new interface enhancements to review your results. Search results will display hits for your term in both the bibliographic metadata (i.e. title, author, subject, publisher, related titles and series, etc.) as well as the full text of books in BHL. If you wish to limit your search to just the bibliographic metadata, select the “catalog” button before performing your search. For each result, expand “Details” to see where your term occurs within each item, be it in the title, keywords, or full text. Overview of the new full text search functionality on BHL. Click on a title to view an item from your results list. You can then use the “search inside a book” functionality (discussed below) to navigate to specific pages mentioning your term. Full text search makes it easier to discover a wider range of relevant content. For example, say you’re looking for information related to invasive zebra mussel (Dreissena polymorpha) populations in the Ohio River. 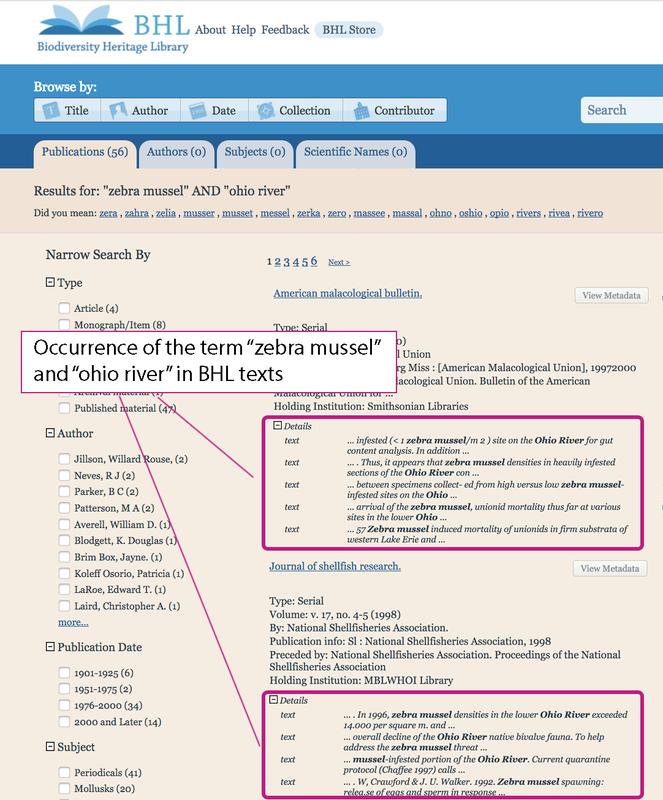 A search for “zebra mussel” AND “Ohio River” yields several intriguing results that may not have been easily discoverable without full text search. Results of a search for “zebra mussel” AND “ohio river” yields several intriguing results in the full text. Note: Image edited to highlight specific results of interest. 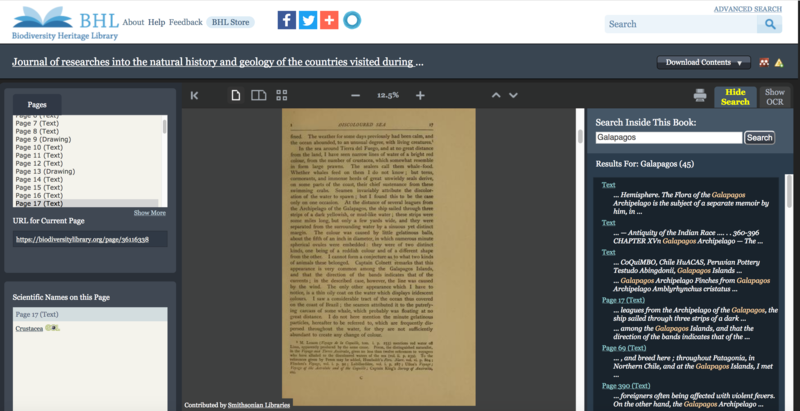 We’ve also enhanced the BHL interface with faceted browsing, making it easier for you to explore your search results by applying filters for content type, publication date, subject, language, and author. To narrow your results by one of the filters, simply check the box next to the desired facet value(s). Use facets to narrow your search results. Search results will automatically update when you select a value, but for best results, select one value at a time, allowing the results set to update, before selecting an additional facet value if you wish to further limit your results. We have also added “search inside a book” functionality, allowing you to search for terms within a book you’re viewing. To use this feature, navigate to the top right corner of the book viewer, select the “Search Inside” tab and enter your search terms. In that same panel, results will display the pages where your search terms are found, along with snippets of the surrounding text. Navigate to any of those pages by clicking on the hyperlinked page number. “Search inside a book” on BHL. 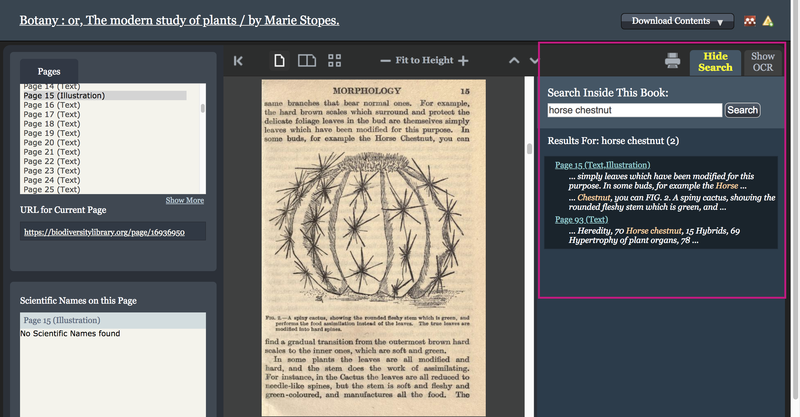 “Search inside a book” is a powerful way to uncover content of interest within a specific book. 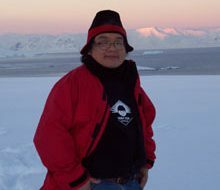 For example, say you want to find the passages where Darwin discusses his time at the Galápagos Islands within his Journal of Researches from the H.M.S Beagle voyage. By searching for “Galapagos”, you can easily find and navigate to the relevant pages. 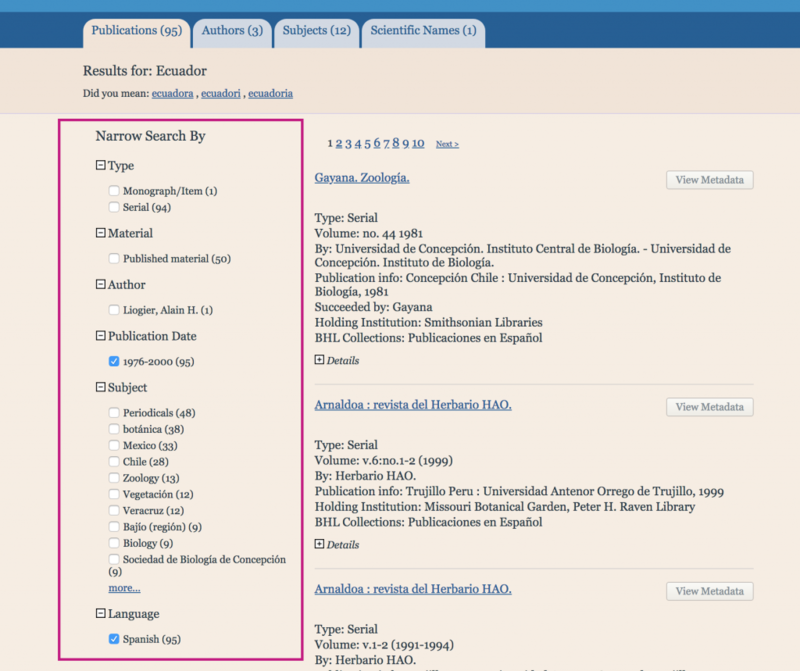 A search for “Galapagos” within Darwin’s Journal of Researches using the “search inside a book” functionality. We’re excited to introduce this much-anticipated new functionality to BHL, and we look forward to seeing what further discoveries it enables. 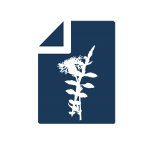 Have questions about full text search or want to learn more about our features and functionality? See our General Search and Full Text Search FAQs. If you have further questions or suggestions for future enhancements, you can contact us via our webform or feedback@biodiversitylibrary.org. In: Memoirs of the American Entomological Society. The physical copy of this item that was digitized for BHL from the Smithsonian Libraries had both issues (30 and 31) bound together in a single volume. Since we attempt to digitize true to the original, physical copy, that is why both were digitized as a single item in BHL. While the metadata for the item does attempt to reflect this (the volume is labeled as “no. 30-31 (1976-77)”, pages metadata for the title pages for each issue state “Title Page (Title Page, Article Start, Issue Start) ” and “Title Page (Title Page, Article Start, Issue Start) ” respectively), the indexing for the second issue is missing from the Table of Contents tab in BHL. Therefore, we have submitted an issue about this through our issue tracking system to have our cataloging team review. We encourage you to submit any future feedback such as this through our webform: https://www.biodiversitylibrary.org/contact. This will allow us to direct the issue to the appropriate staff for review. 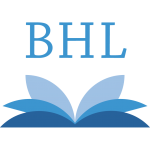 Thank you again for your feedback and use of BHL! You should have received an email reply about this issue as well, but we just wanted to verify that the cataloging for this item has now been enhanced, with no. 31 now indexed in the table of contents and thus searchable in BHL by the issue title as well: https://www.biodiversitylibrary.org/part/272054. Thank you again for submitting this feedback, and don’t hesitate to let us know if you have any further questions or comments. We’re sorry to hear that you are having trouble downloading the PDF of “A Monograph of The Pittidae.” We were able to successfully download the file as a PDF using Firefox (version 61.0.1). However, as you state, this is a very large file (824 MG) and it took about 15-20 minutes for the file to fully download in the browser. You’ll also want to make sure that you’re attempting to download the file through a connection with robust bandwidth. You may want to try downloading the file on a different connection with higher speed or (if you’re using a connection shared by many people) attempting to download during hours when there are likely fewer people consuming bandwidth. 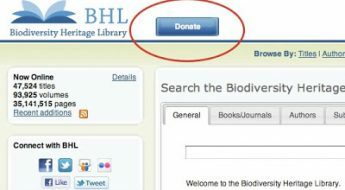 If these suggestions do not work for you, please submit feedback via our webform (https://www.biodiversitylibrary.org/contact) so that we can direct the issue to the appropriate staff for review. 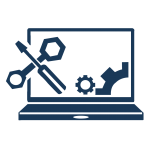 Please be sure to mention all of the workarounds that you have tried thus far and provide as many details about your browser and the errors you are receiving when attempting to download the file. Thank you for your interest in and use of our library, and I hope these suggestions help!